The key financial objectives of the University are to provide the long-term resources to strengthen and further its pre-eminent position – nationally and internationally – as a place of outstanding learning, teaching, and research; and to enable it to provide additional support to its three core priorities of students, academic posts, and buildings. The colleges of Oxford University (apart from Kellogg and St Cross) are independent, self-governing and financially autonomous. In 2017/18, the total annual incoming resources of the 36 colleges (including donations for capital projects or endowment) amounted to £493m. 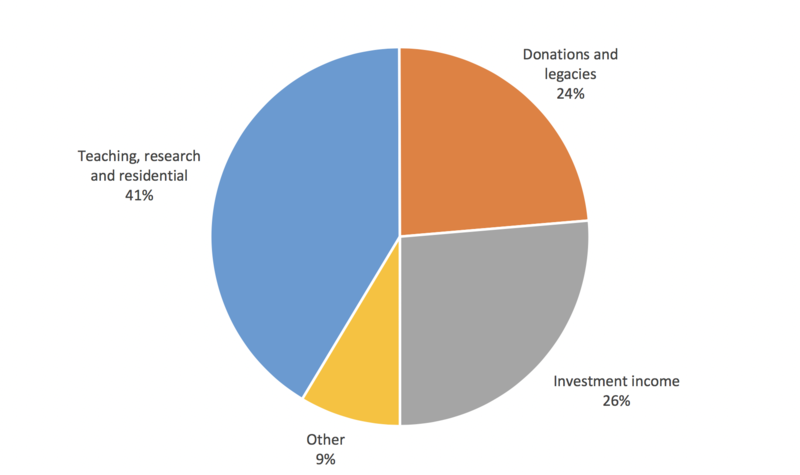 The three main sources of income are: (i) teaching, research and residential; (ii) donations and legacies (towards both annual expenditure and endowment); and (iii) investment income, as illustrated in the chart below. Other income derives mostly from trading activity such as vacation conferences. Total resources expended in 2017/18 amounted to £437m. 84% of this expenditure was directly attributable to the core charitable activities of the colleges, activities, including teaching, research and residential services. The balance was split between the costs of fundraising, running trading activities such as conferences and tourism, and investment management costs. The University has endowment assets of £1.2bn. Individual colleges have their own endowment assets, which amount to £4.9 bn.